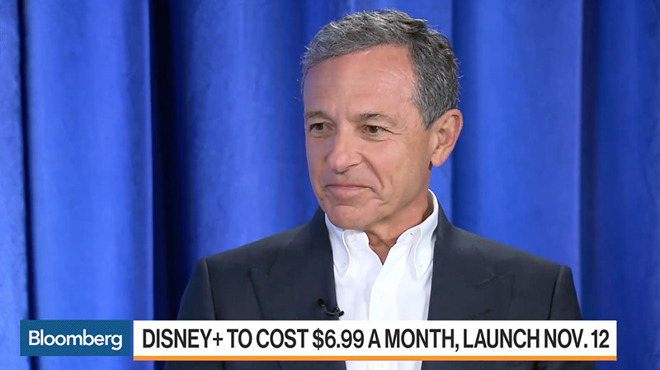 Iger revealed the launch strategy in an interview with Bloomberg shortly after he and other Disney executives revealed plans for Disney+ during an investor event at the company's California headquarters. At the keynote, Disney specifically mentioned deals with Roku and Sony that will deliver Disney+ to set-top boxes, smart TVs and PlayStation devices, but failed to present an exhaustive list of platforms that will support the Disney+ app. Iger clarified the issue in the interview. "The app will in all likelihood be available through traditional app distributors, Apple being one of them," Iger said. "So I'm fairly certain that if people want to buy the app -- sorry, subscribe to the app is probably a better way to put it -- they'll be able to do so through Apple and the iTunes Store." While not an explicit admission that Disney+ will be made available on Apple TV as a tvOS app, the statement suggests Disney has no issue with marketing the service on Apple's branded set-top box. Doing so would subject Disney to Apple's customary 30% revenue sharing scheme (15% for subscriptions lasting longer than a year) and put it on a platform owned by a market competitor. Apple plans to launch its own Apple TV+ service this fall. The move is unsurprising as most streaming companies, including Netflix and Amazon Prime, offer tvOS versions of their apps. Like any other content-centric business, streaming services strive to reach as many viewers as possible, and Apple TV accounts for a significant share of the set-top device market. Bloomberg also queried Iger on his role as an Apple board member, a position that could be in jeopardy given the two companies will soon be streaming industry rivals. Iger seemed to suggest that there is no conflict of interest, at least not yet. It seems the topic is rarely broached in board meetings, but that could change once Apple TV+ launches and efforts to expand the service intensify. "That business is still nascent to Apple and still relatively small, so it's not really discussed all that much," he said. "So far it's been OK."
Isn’t this only if Disney allows signup in-app? If signup is only allowed on the web then they wouldn’t pay Apple anything. Iger didn’t say it would be part of Apple’s TV app, though I’m sure Apple will push hard to have it there. I’m willing to bet the Apple TV service will be subject to lower fees. Apple had to convince these services to join the scheme and I doubt Apple got to have its cake and eat it too, it definitely had to give some. Iger on the Apple board won't be like Google vs Apple. For a few pretty simple reasons: Apple TV+ is about acquiring and keeping people in Apple's ecosystem via exclusive content, Disney+ will be on AppleTV, so there is no reason for people to leave Apple's ecosystem if choosing Disney+. Also for Apple's target demographic (i.e. the end that can afford services), Disney+ isn't going to pose competition because this demographic will likely be able to afford both services. As for Disney, Disney+ is about revenue and brand - that's their MO, and it's priced in such a way that it can be added to existing services for minimal pain - or for those with less income, switch out of Netflix for an arguably better lineup of content. Also worth keeping in mind that until recently Disney's largest shareholder was Apple's largest shareholder, and she is still a significant holder of Disney stock. Two pluses can only amount to a bigger plus! Awesome news. Iger is obviously not a Schmitt. So do we know what the additional cost will be on AppleTV, the same $6.99? I haven’t seen if Disney+ will be offering movies in 4K. Can anyone confirm they will or won’t? Nobody (I checked three reliable sources) has mentioned it, so it definitely didn’t come up at the event or in the follow-up. I think it’s about hardware requirements, right? I’ll guess it’s safe to say that if I can get Coco in 4K in iTunes on my tv 4K then Disney+ will be able to do the same on the same hardware. Nope, the article says Disney hasn't even confirmed 100% that Disney+ will be available on the AppleTV+ service. I would certainly expect it to be but perhaps at a slightly higher cost than going direct. On the same note Chromecast was confirmed, but Android TV wasn't an absolute either, at least yet. Perhaps still negotiating the share percentages with some services before announcing availability, which would make sense. Well, I hope it's safe to say that. Currently there is no 4K Disney (or Pixar/Marvel/LucasFilm) content available through iTunes. There was some speculation that Disney was saving 4K for their own service. This article says it will support 4K HDR playback. Thanks! Good find, they saved that to almost the end, ha ha! I read "CEO Bob Iger elaborated on the upcoming release, saying the company plans to offer the product on Apple TV." I highly doubt he's not going to follow through. Anyhoo I just bought a load of DIS seems like a good bet. My AAPL is up over 1000% on average (early purchases over 2000%) but my Netflix only 300% so I switched Netflix for Disney just for fun to see how it does for a year or two. This will be a successful streaming offering. Basically, it will appeal to every family with children anywhere in the world that has access to high-speed internet. I think, however, that the 'cord-cutting' market is starting to get ridiculously fragmented. One, it's going to make things an uphill battle for Apple to rise above the din. Two, people might just avoid the confusion and stick with cable, i.e., the fragmentation from cord-cutting could paradoxically result in the opposite. Ah, you are looking at a different source then. While not an explicit admission that Disney+ will be made available on Apple TV as a tvOS app,..."
I hadn't seen the other quote you posted so it's appreciated. Non-cable services are fragmented because human interests and preferences are fragmented. I have zero interest in any sports service, or this Disney service (yup, I don’t even care about streaming Marvel content - zoiks!). I will pay HBO, Starz or iTunes when my shows are running. Since they all have apps, it isn’t an issue in the slightest, and I don’t see that changing. My view is that the pricing on iTunes rentals & purchases is mostly something that the content producers push for. Not to devalue the respective rental & DVD/BR markets. Apple could certainly generate significant attention with a big discount on iTunes rentals with a TV+ subscription. The beauty of iTunes is that almost ALL new releases are there for rent, along with a huge backlog. The issue is price - here in Canuckistan it ranges between $4.99 (back catalog) to $6.99 (most new releases). Imagine getting rentals at $1.99 (back catalog) to $3.99 (new release), along with the TV+ content, for $9.99/month. Or an X% discount on purchases? That is good value, and frankly would cost Apple less than huge investments in original content. I would signup for that in a heartbeat. Make sign up and billing easy. Make it work seamlessly across all my Apple devices. Provide always on streaming and access as promised. Stream at the highest quality my connection and device will support. Here you go. From Apple Insider ... hard to miss I'd have thought. Thanks to this I made a killing on DIS today and saved losing a ton on NFLX .